The book begins with a quiz for the reader to see if they qualify as a strong-willed woman. It wasn’t even a question in my mind if I were going to pass the SWW quiz. I am well aware that I am a strong-willed woman, and that was the main reason why I chose to read this book. The author said that before she could identify that her strong will was normal, she would ask herself, “Did God approve of me even though I didn’t exactly fit the ‘quiet, virtuous Christian woman’ mold?” (169). I have asked myself this question countless times. Cynthia’s message throughout the book is that of course God approves of strong-willed women; we were created this way for a reason! A main theme that runs throughout the book is the idea that there is a drastic difference between a strong-willed woman with God and a strong-willed woman without God. The book aims to teach women how to be a strong-willed woman with God, and how to use that strong will for God’s glory. Cynthia stated that SWW encounter three stumbling blocks to fully surrendering to God: repentance, submission, and obedience. As strong-willed women, we must keep these three things as priorities in our relationship with God in order to prevent our strong will from going sideways. The author never placed stereotypes or generalizations on women, and I appreciated that she recognized strong-willed women come from all walks of life, and leadership comes in many different shapes and forms. She emphasized that “true leadership is not confined to gender” and as women we should always seek to “pursue leadership where we feel God has gifted and called us” (120). One of the best elements in the book was the use of Cynthia’s personal story, as well as the stories of other strong-willed women to illustrate the book’s main ideas. The depth and vulnerability of the stories were impactful as they spoke of topics such as infertility, depression, difficulties in marriage, immigration, and abortion. The chapter on marriage was full of excellent advice on how to handle conflict and how to listen and speak well to one another. However, there was one area of concern. On the topic of submission, she writes: “Every SWW has to wrestle with the concept of submission - not just to God, but also a biblical submission to her husband’s leadership in marriage” (140). I was confused after reading this chapter, because while she had many good things to say about how neither spouse is the boss in marriage and marriage only works when both spouses seek to honor each other and God, she kept returning to the husband being the leader in marriage. As an egalitarian reader, I struggled with this aspect of her theology of marriage, and I would want readers of this book who are looking for egalitarian material to be aware of this. I admire the author’s willingness to write on a topic that is crucial for Christian women to hear. Cynthia writes, “The Enemy would have us think that it’s wrong to possess strong will. He tries to make us feel guilty for using it or to discourage us from speaking up, especially in the church” (6). Too many strong-willed women are afraid to be themselves because it is often communicated that it is only appropriate for women to pursue a “gentle and quiet spirit” —that is, if you have strong-willed tendencies, you must suppress them in order to live as God intended. This narrative needs to be put to rest, and this book seeks to do so by speaking out against the suppression many women face. I believe this book would be most helpful for women who are strong-willed, but struggle with feeling like it isn’t correct or godly behavior. This book is for strong-willed women who need to be empowered to live out their God-given personalities in a way that glorifies God. As a strong-willed woman, I was encouraged to hear that the struggles that I face are normal and that I am not alone in my journey. 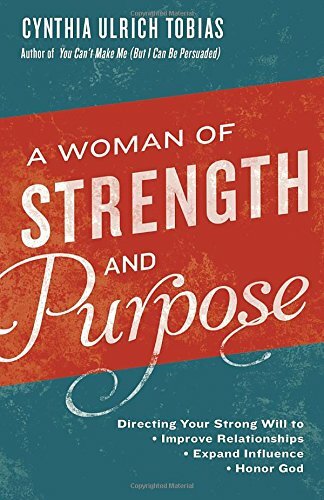 If you are a strong-willed woman, or if you know of a strong-willed woman who needs some encouragement to be who God has created her to be, I would recommend this book to you. Taylor Kropelin is the events associate and chapter liaison at CBE International. Taylor received her bachelor’s degree in pastoral studies from North Central University. She is a vocalist in a Minneapolis-based Americana band, Margot. She resides in Minneapolis with her husband, Brandon.